Congratulations to the winner of our 4th annual Motorz Mega Craftsman Christmas giveaway, David Pelayo from La Puente, CA! David was notified by me personally on Christmas Day after he was selected randomly from the thousands of entries since Thanksgiving Day. Here’s what he told me! He won over $9,000 worth of amazing products from our gracious sponsors: Craftsman, Katzkin, Kicker, Covercraft, GoPro, PitStop Furniture, PIAA, Mothers Polish, Superwinch, and E3 Spark Plugs! Congratulations, and a very merry Motorz Craftsman Christmas to you, David! 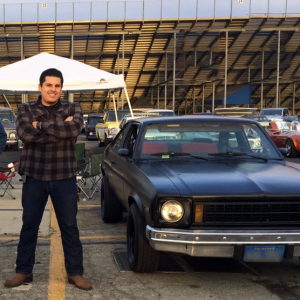 We can’t wait to learn how you’ve put all these great products to use with your ’77 Chevy Nova! Here’s the complete list of what David has won! Katzkin® leather interior for a domestically owned passenger vehicle. Established in 1983, Katzkin is the leader in automotive leather interior. Now offering more than 3,000 vehicle applications, Katzkin can provide a beautiful new leather interior for just about every domestically owned passenger vehicle today. Every Katzkin leather interior consists of more than 200 individual parts that are custom cut, combined, expertly sewn, inspected, packed and shipped within 24 hours of receiving the order at the manufacturing facility in Montebello, Calif. Using a revolutionary internal production process, Katzkin staff are specially trained and devote attention to every detail of the process reflected in the exceptional quality of Katzkin products. KICKER graces the Stillwater, Okla., skyline and has stayed true to the values from which the company was built. KICKER products are designed and shipped from a 280,000-square-foot facility that houses nearly 200 energetic individuals who constantly push the limits of audio-design technology and performance. KICKER products are currently sold by approximately 1,200 authorized dealers in the United States, and export sales are managed through a network of distributors serving over 2,000 dealers in approximately 50 countries. For 50 years Covercraft has manufactured premium quality exterior and interior protection products for automotive enthusiasts, building a reputation for quality, durability and design. Think it. See it. Do it. We dream. We have passionate ideas about what’s possible in this world. Our passions lead us to create experiences and realities that expand our world and inspire those around us. GoPro helps people capture and share their lives’ most meaningful experiences with others—to celebrate them together. Like how a day on the mountain with friends is more meaningful than one spent alone, the sharing of our collective experiences makes our lives more fun. The world’s most versatile cameras are what we make, enabling you to share your life through incredible photos and videos is what we do. Designed to appeal to all car enthusiasts, from racing fans to concours and vintage enthusiasts to hot-rodder’s, PitStop designs incorporate a number of patents and create a realistic behind-the-wheel experience in a replica of a racecar driver’s seat. Upholstered in top-of-the-line leatherette, the chairs feature billet aluminum shift knobs on the operating arms, tire-embossed three-way adjustable armrests, five-spoke wheels, swiveling high-performance brake disks and calipers, and hydraulic lift mechanisms nestled inside ABS coil-over springs. The expanded PitStop line now includes a variety of office chairs, footrests, full-size and compact desks, side tables and storage units, along with bar tables, chairs and stools. PIAA Corporation was established in 1963 with the commitment to manufacture world-class driving lights that our customers could use with pride and confidence. Today, PIAA upholds that commitment by combining market driven concepts with the latest technology to make night, inclement weather, and off-road driving as safe as possible. Research and Development is at the heart of what PIAA does, and we take it very seriously. PIAA’s R&D technicians continually raise the bar on visibility products. The PIAA design process is simplistic in nature and has never varied since the founding of the company in 1963: Make the best products possible, and never compromise. PIAA has taken these same values and expanded the business to from driving lights to fog lights and high out put replacement bulbs. Today PIAA is leading the way in the off road market with the new developments in their proprietary LED technology, as well as Xenon performance. Back-to-Black® Tire Shine, 24 oz. California Gold® Carnauba Wash & Wax, 64 oz. revision™ Glass + Surface, 24 oz. Polished Aluminum Wheel Cleaner, 24 oz. Mothers® is known worldwide for its premium-grade polishes, waxes and cleaners, and offers a broad array of finish care products under its Back-to-Black®, California Gold®, PowerBall®, and Professional lines. Go to www.mothers.com for information on all of these products, along with a host of how to videos and car care tips in the online Mothers® Detail Guide at www.detailguide.com and the Wax Forum at www.waxforum.com. Follow us on Facebook at www.facebook.com/mothersusa. Superwinch’s global manufacturing facilities have grown to design and produce a broad range of winches; from electric 12, 24 and 115 volt planetary gear, right angle gear and worm gear units to hefty hydraulic workhorses. Our 1,000 to 50,000 pound capacity winches can be found in diverse industries and applications around the world. These products share Superwinch’s common traits of first class design, quality, value and solid construction for safe, simple and reliable operation. Gift certificate for E3 spark plugs and apparel. With decades of experience in spark plug engineering and the automotive aftermarket, E3 Spark Plugs realized that the key to producing a better spark plug did not lie in the use of fancy metals, but would require a entirely new approach in the design of the plug’s electrode to improve the ignition of raw fuel inside the engine’s combustion area. E3’s initial research started in its own laboratories and led to the testing of new designs at two leading engineering universities. After investing in years of research and assisted by top professors in the field of combustion and engine dynamics, the DiamondFire electrode technology was developed. Since this advanced design increased the combustion pressure inside the engine before raw fuel was exhausted, they had discovered a better way to control the burn – this increased power output and fuel efficiency, and reduced emissions for gasoline-powered engines.